Exciting times as A Liquid Future opens a learning centre! SurfAid, a humanitarian organisation who has been active in the Mentawais for over a decade and is responsible for vastly improving the living conditions of the local communities, have kindly let us use their wonderful community building in Katiet to teach English classes from and to use the surrounding area for recreational activities such as badminton, volley ball, skateboarding, table tennis, drawing and painting. With the donation received from the Portuguese Association of Surfing Friends of Indonesia (Associação de Surfistas Amigos da Indonésia – A.S.A.I. ), a Liquid Future was able to provide textbooks, pens, and recreational materials for the centre. It’s been a hub of activity ever since with two English classes running in the afternoons. One class studies while the other enjoys the recreational activities available. Skateboarding, badminton, volley ball and drawing and reading books are the favourites! The local schools have very few of these things and so the kids relish the chance to use them. It’s a pleasure to see them enjoying and gaining all the benefits the matierals provide them with. One boy reading a book on dinosaurs asked me if dinosaurs lived in Africa at the moment! Their thirst for knowledge and to learn is evident. Before the first class is finished, students in the following class are lining up at the door, ready to study. Education generally is highly valued here and students are delighted to have their own textbook. 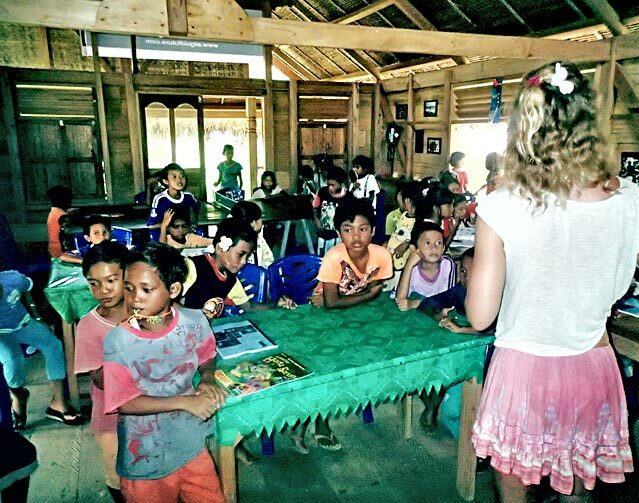 Currently there are approximately 20 to 25 students in each class, with new students arriving from two of the surrounding villages. Word is spreading as is the number of people speaking English. Great news!